The Professional Teacher Association Network (PTAN) was founded in mid 2002, with a support from Aga Khan University, Institute for Educational Development and Aga Khan Foundation, Pakistan. PTAN is a cluster of nine voluntary associations striving for the professional development of teachers/head teachers. Timing: 9:00 a.m. – 4:00 p.m.
For registration, please fill in the attached form and submit it along with course fee of Rs. 1,500/- in cash or pay order in the name of “The Aga Khan University” to PTAN Office between 09:00 a.m. to 05:00 p.m. (Tuesday-Saturday). Last date of registration is Saturday, June 29, 2013. 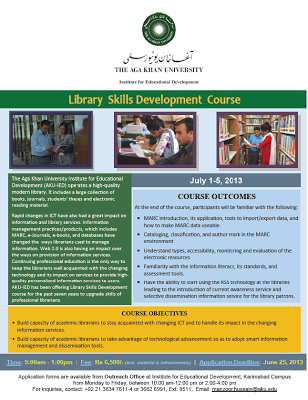 Since the course seats are limited, registration will be done on first come first served basis. Registration will be closed once the sitting is fully subscribed. Pakistan Association of Inclusive Education (PAIE) and Danishkadah organizing a one day seminar on education of people with hearing loss, theme " Including the Excluded through Improving Education Quality"
Background information and outline about the seminar are enclosed herewith. We invite you to submit a brief paper on one of the topics below. Your paper needs to be based on reflection on your experience of teaching and learning children/people with hearing loss or empirical research data. You will be invited to present your paper at the seminar once it is accepted by the organizers. You can submit your paper at one of the email addressed given below. Please feel free to forward this invitation to other schools, educators and parents of people with hearing loss. ü Are you struggling in team building process in your department / school? ü Do you want to know why conflicts are created? ü Do you want to know how different people handle conflict differently? ü Are you interested to know the effective way of conflict management? ü Do you want to assess your leadership skills with reference to conflict management? If the answer of any of the questions is YES then this workshop is for you!!!! Let’s join together to learn about "Conflict Management – A Key to Effective Leadership", a recent but very effective notion in education. School Head Teachers’ Association (SHADE) invites you to attend this workshop on Saturday, June 15, 2013 from 9:00 a.m. to 1:00 p.m. at Aga Khan University, Institute for Educational Development. Shairose Irfan Jessani is currently working as a Vice Principal – Academics at Aga Khan Higher Secondary School, Karachi. She has done Masters in Science (Chemistry) from Karachi University and Masters in Education (Teacher Education) from Aga Khan University, Institute for Educational Development (AKU-IED) with distinction in course work. She has contributed both at school and community level, as well as worked with organizations like Professional Teacher Association Network (PTAN), Edlinks, Ministry of Education and AKU-IED as a resource person. Her major interest areas are assessment, educational management, teacher leadership, environment, science education and ICT integration. In view of limited seats available, prior registration for this workshop is mandatory. 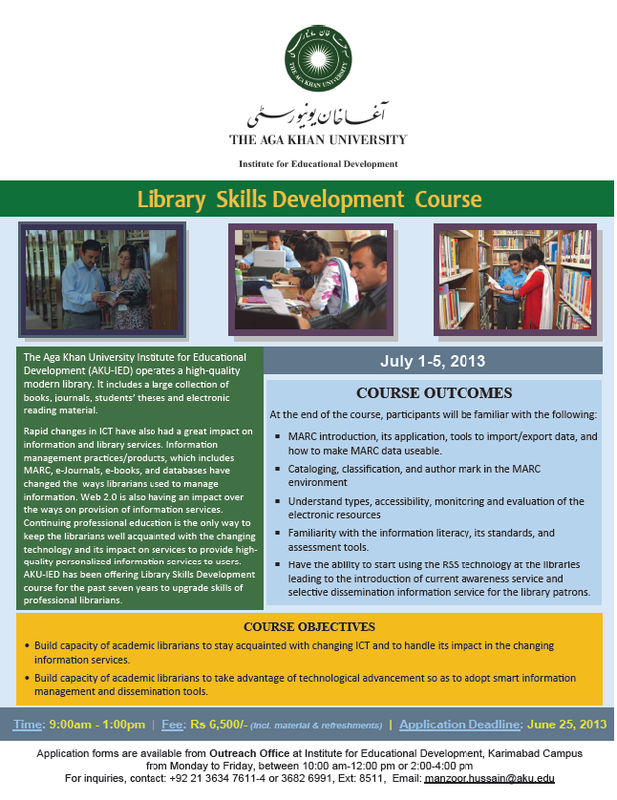 Kindly confirm your participation latest by June 13, 2013 at registration@ptan.org or (36826991-4/36347611-4 Ext. 8554 / 8556), as this will facilitate us in organizing the workshop effectively. We look forward to your participation!